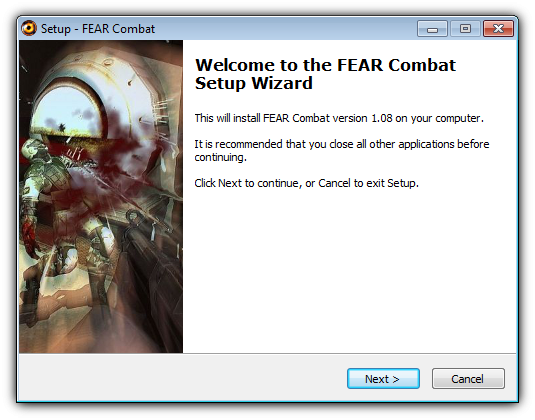 We are happy to announce the availability of the new FEAR Combat 1.08 full Installer. Is a installer that lets you get the latest version of FEAR without extra patches, in a single file. If you have already the game installed, you don’t need It. If you want to start playing, this is the best choice, because you won’t need extra patches or updates, It will install the 1.08 version. Also If you got a new SEC2 FEAR CDKey, this will be perfect for you, because unlike the old installers, It won’t ask for a old CDKey on install. Once you complete the setup, you can add your key. Download, run, next, next, next. Need some guide? Check this detailed Setup guide at RAW Recruits Site. Includes the CDKey updater tool. Filesize is 1.68 GB (If possible use download managers). some people have reported issues with Miscrosoft Security Essentials. If you have It, try disabling It. It’s only that It doesn’t like the high compressed files. You can also try just disabling “Scan Archive Files” in MSE (under Settings -> Advanced). hallo brauche einen cd key habe das spiel schon heruntergeladen aber leider noch keinen cd key kann mir jemand helfen wie ich einen bekomme . Der Key steht oben rechts. Klicke auf “Check my CD-Key”. Und da findest du ihn.